One of the new Miracle players hit a huge home run in the ninth inning to help the team to a come-from-behind win. Another newcomer fell a double away from a cycle. A 2018 draft pick was a home run from a cycle. And another prospect whose name has graced these minor league reports nearly every day this season had yet another multi-hit game. And a former top pick and top prospect found out that he is heading to the big leagues. The Twins announced their trade of Fernando Rodney late on Thursday night. On Friday morning, they announced that Adalberto Mejia was headed to the disabled list (wrist). Those two roster spots were filled by RHP Tyler Duffey and 1B/DH Tyler Austin. Reports surfaced on Friday late afternoon that RHP Kohl Stewart had been scratched from his Friday night start in Rochester. He was called up to the Twins and will start on Sunday. RHP DJ Baxendale and OF LaMonte Wade were activated from the Rochester DL. DJ Baxendale returned from the DL and made the start. He worked a perfect first inning, but all three batters he faced in the second inning got on base. Luke Bard came in and gave up five runs (three earned) on five hits and two walks in 1 2/3 innings. He struck out three. Nick Anderson came on and threw 2 1/3 scoreless innings, striking out three. John Curtiss struck out two over three, one-hit innings. Alan Busenitz pitched a scoreless ninth inning. The Red Wings had six hits in the game.Only LaMonte Wade, also just off the DL, had two hits. Luke Raley had a breakout game for the Lookouts. He hit his second Chattanooga home run and his first triple. He had three hits. Brent Rooker had three walks to go with a single and three runs scored. Zander Wiel had two hits and a walk while Jaylin Davis had two hits as well. Jordan Gore added this second triple. Dietrich Enns started and went the first 4 2/3 innings. He gave up two runs on six hits and a walk. He struck out seven. Omar Bencomo came on and struck out three over 4 1/3 scoreless innings. Down 4-3 going into the top of the ninth inning, Ryan Costello hit a game-tying, leadoff home run. Aaron Whitefield (pinch running for Ben Rortvedt) later scored on a wild pitch. Ernie De La Trinidad provided some insurance with an RBI single to score Royce Lewis. Alex Kirilloff led the offense. He went 3-for-3 with his 17th double. He also threw out a runner trying to advance to second base. Costello went 3-for-4. The homer was his second with the Miracle. De La Trinidad went 2-for-5. Lewis was 1-for-3 with a walk. He was also hit by a pitch. Andro Cutura started and worked the first seven innings. He gave up two runs on six hits and a walk. He walked one and struck out six. Jovani Moran struggled a bit, but he got the win. He went two innings and gave up one run on two hits and three walks. It was a low-scoring game in Clinton. Blayne Enlow started and gave up a second-inning run. Enlow gave up only the one run on three hits over five innings. He walked one, hit two, and struck out four. Jared Finkel came on and gave up two hits over three shutout innings. He struck out one. The Kernels managed just five hits and were unable to cross the plate. Trevor Larnach went 2-for-4 with his second double. Trey Cabbage added his 17th double. The game was postponed by rain. The teams will play two games on Saturday. Casey Crosby made another rehab start for the Twins. The lefty gave up two runs (one earned) on one hit and two walks in 1 2/3 innings. He struck out two. Niklas Rimmel came on. He gave up four runs (three earned) on seven hits over 2 1/3 innings. Dylan Stowell and Denny Bentley each threw two scoreless innings. Bentley struck out three. Charlie Mack led the offense. He had a single, his third double and his first triple in this game. Estamy Urena went 2-for-4. Erick Rivera walked twice. 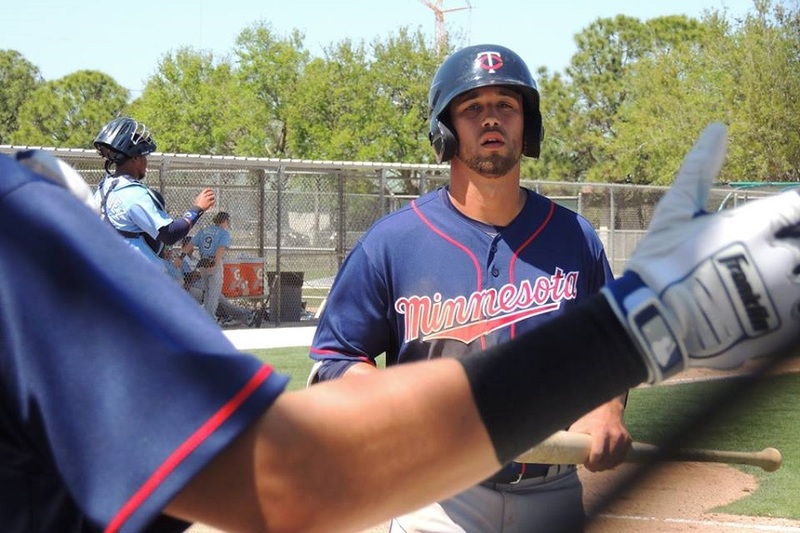 Twins Daily Hitter of the Day: Ryan Costello, Ft. Myers Miracle (3-4, HR(2)). #14 - Lewis Thorpe (Chattanooga) - Did not pitch. #16 - Yunior Severino (Elizabethton) - Rained Out. #17 - Lewin Diaz (Ft. Myers) - Out for the season (wrist). Can we get Wade up as the 4th OF now that he's healthy? Perhaps the Twins can DFA Field and slip him off the 40 man roster but keep him in the system, because I certainly don't want him on the 40 man over the offseason. Sure, they could do that... though I'm sure they'd like for him to at least play a few games first. 2.) come up to the Twins as a 4th OF and play twice a week? For me, it's an easy choice. let him play every day. Let Cave play every day. Let Field be the twice a week guy who probably starts against some lefties. Call up Wade right after the Red Wings season ends (Labor Day) when his two options are get called up and play 2-3 times a week or go home and not keep playing. Trevor Larnach (#6) is now in Cedar Rapids. Wade did look good tonight. I arrived in Rochester expecting to watch Kohl Stewart, but as noted above, Baxendale and Bard failed to get into the 4th inning. Could Wade's awesome on-base % (.380's) = Grossman with a glove + pinch running versatility? There is no way in any baseball world that Stewart deserves a start at the MLB level. Especially over Gonzalves or Romero. He's been mostly a failure. I am a fan of the FO, but this year they have left me scratching my head. They have not reigned in the MOY with his bullpen usage, which is a real thing, and moves like this make no sense. None. Well, that is sort of dictating the terms of the decision. If you are willing to move on from Morrison, that would open up a couple more starts a week, without taking away from Cave. And with the other DH games and Mauer's days off at 1B, that could support ample opportunity for Austin too. There are also two different types of players to evaluate. Those you think have it, and those you suspect don't. The only way to find out is give both of them a chance. Who knows. Maybe Stewart becomes a BP piece? Frankly I don't see him making it as a starter, but they have enough invested in him to find out. Best of luck to Stewart. I guess there is no time better than the present to give him a shot. Hopefully, he can show why he was drafted so high. That would be better than adding to the reminder that Stewart/Gordon/Jay could have been Manaea/Nola/Benintendi. I mostly agree, but with one quibble (which I boldfaced) that a sunk cost is a sunk cost whether it's time or money, and you can't get it back no matter which way you decide how to go forward. But your statement is close. Kohl has enough experience by now (drafted at 18 and he'll be 24 next season) that he's either about ready to make it, or probably never will be. So, it's time. Time to promote Brent Rooker? In the past month he is hitting .302/.433/.583 (1.017) with a 19.2 K% and a 19.2 BB%. The Ks have come way down of late, and the BB% up. I say let him finish the rest of the year at Rochester, and if he does well there, have a call up. I'm 50-50 on this.Sure I want to see Rooker do well and get a call up, but we have Rosario and Kepler at the corners and Austin at 1B.So, in a way there is no rush.Start him at AAA next year an see what happens.Same as what we did with Gordon.Problem with Gordon is he kind of failed at AAA, so I suppose he'll be there next year too.But I still want to see Rooker this year! Seth, why do you think Gonsalves has not been called up when others with inferior minor league career stats have? I realize he just pitched Thursday so he couldn't pitch Sunday, but he could/should have been called up for at least a spot start in the previous 3 years. Twins justify Stewart start saying "we have to see what he can do" and I agree with that, but what about the much better prospect? At the same time Kohl could have earned a September call up. They could see him then. To not find a spot in the rotation for the other prospects who should be challenged now is silly IMO. You inspired me to take a look back at what could have been. I think it is fair to say the Twins blew it big time with Jay. And yet Nola was a college pitcher, and he looks like the best pick from the year before. And 2013...the Mark Appel draft. just take a look. Yuckos. First, how the teams that "scored" instead of the Twins fared in those three drafts. Picking shortly after the Twins in 2013 at #7, the Red Sox passed on a variety of useful players to pick Trey Ball. Like the Twins--and EVERY other team in MLB--they also passed on Manaea and Judge, who were taken in the comp round. Even the Yankees passed on Judge, to take Eric Jagielo, a shortstop out of Notre Dame. With their pick directly after Judge, they passed on Manaea to take Ian Clarkin. The Phillies took J.P. Crawford at #16--pretty good pick, I guess, although at this point if he has Trevor Plouffe's career he'd probably be happy. Dozier, at #8, signed for well under slot, and to date is at -1.3 WAR as an MLBer. Overall, the 2013 draft looks awful for everybody except the Cubs with Bryant. I'm not giving the Yankees too much credit for their 1 out of 3 find in Judge. Click on the link and see for yourself what that draft looks like. The Phillies got Nola at #7, right after the Twins took Gordon and the Mariners took Alex Jackson. Aiken and Kolek were taken before him as well. Man, just think how good the Astros would be if they hadn't botched the Appel and Aiken picks--Bryant and...well, maybe they got lucky after all on the Aiken botch, turning around and landing Bregman and Kyle Tucker. The Royals got Finnegan at #17. The only other notable players in the next 20 picks are Justus Sheffield, Kopech, and Derek Fisher at 31,33, and 37. Boston took Chavis at 26, passing on Sheffield, and of course, Kopech the first time. Oops-Just noticed Matt Chapman went 25th, three picks after the vaunted Dodgers player development team passed on him for pitcher Grant Holmes. Maybe the Red Sox were sitting on him and just missed. I'm sure they were. This draft looks pretty good, and to add insult to injury--picks 5-10: Kyle Tucker-Jay-Benintendi-Carson Fulmer--Ian Happ--(and I'll just throw in Cornelius Randolph.). At the top was Swanson, Bregman, and Brendan Rogers, with Dillon Tate, who has been traded for Carlos Beltran and Zach Britton so far. Boston got Beni. The Phillies took the aforementioned Randolph at #10, passing on later 1st rounders Kolby Allard and Walker Buehler. The Royals took Ashe Russell at 21, also passing on Buehler by two picks. Mike Soroka was taken at #28. The draft is such a crapshoot. Just take some time scrolling through those lists of players. When you look at that Kohl Stewart draft, I think we should be happy to have a guy make the big leagues at all, even if it is brief. Benintendi I'll concede, but it is pretty revisionist to suggest the Twins should have passed on Stewart to take Judge or Manaea. 25+ slots before they went. This is arguably Kohl's best year, IMO. K's up, BB's down.. FIP is low. I believe Kohl can become a FA after this year if not added to 40 man (correct me if i'm wrong), so might as well see if this years #'s can translate to MLB. No minor league FA for Kohl yet. Would have been eligible after 2019. Good to see Charles Mack acclimating - .314 over his last ten games. Thank you!! Only took me a week to make that change in my template... Thank you! While I don't agre that he's been 'mostly a failure.' (he's put up solid numbers most of the way, just without the pretty Ks), and I think that Romero and Gonsalves have done more in the past, I think we have to be a ltitle careful. I've talked to several people around Rochester and Chattanooga, and they will say that Stewart's stuff is really good, and he has been pitching really well. If they are going by reports that I'm sure they're getting form Rochester, I'm sure that it makes sense to call up Stewart. At least if they're talking to people who think the same as people I've talked to. If they did call up Wade, then they would need to play him and they would ahve to play him or it doesn't make sense. My thought is that a guy that's 24+ and still a prospect should play at least 4 games a week to justify not playing 6 games a week in AAA. I've heard this as well. Many think that he could be a really good reliever as well. I don't believe Judge was ever seriously considered as a top pick... by anyone. Manaea was, but he also got hurt and fell pretty hard due to it if I remember right. KC pulled off a big underslot move to get him. I mean, until the last 4-5 starts, his control/command was not good. That's the big reason why.And timing has been a reason at times too. I'll be shocked if he's not called up for September. And, I just think that if scouting reports matter at all - and they absolutely should - Stewart's stuff has a chance to be good. Great ground ball tendencies, etc. And they made a decision on Gonsalves last offseason. They have to make a decision on Stewart this offseason and this gives them an up-close look. Can he show enough to keep on the roster? Can he be a starting option? Is he a bullpen guy. Seth since we are on the topic of promotions with Kohl Stewart’s call up to Minnesota I have to wonder why Lewis Thorpe hasn’t been promoted at least to Rochester? For him to have his 3.58 ERA, have more innings pitched than hits given up, have batting average against of .251 (when at one time it was around .360), and a WHIP of 1.25 it took a Herculean effort to do so and yet it looks like he’ll end the year in Chattanooga. Why? My thought is if he does well he should be rewarded, right? A lot gets made of Kohl’s SO/BB splits and while that’s nice Thorpe’s in the same amount of innings is 131/30...significantly better than Kohl’s and for this being his 1st year in AA and for his lack of minors experience (thanks to Tommy John and Mono) is exceptional. So should he at least start next year in Rochester, I mean one thing to look at is control AND command. Thorpe has had great control all year and based off of his improvements his command seems pretty exceptional too, good enough to be moved up IMO.